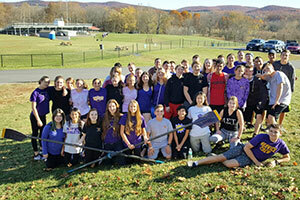 Crew Team has continued success! Last weekend, the Warwick Valley High School Crew Team participated in the New York State Championships in Saratoga with great success! 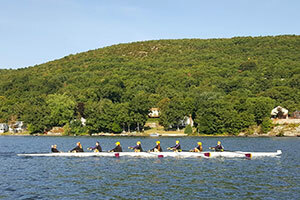 Warwick entered 10 events – 2 two-person boats, 4 eights and 4 fours – for a full weekend of racing. Eight of our crews advanced to finals, and three of these crews placed third with bronze medals. Girls light 8, Boys light 4 and Girls 8 qualified for Nationals. This is Warwick Crew’s best showing at States and the first time we’ve qualified for Nationals in the big shells (4’s) and (8’s). This is big news for our program, and we’re becoming a force to be reckoned with! Unfortunately, due to logistics and equipment shortage, only the Boys Lt wt 4 will be able to accept our National bids. This, by no means, takes anything away from our Girls 8 and our Girls Lt wt 8 who qualified, but will not be able to accept their bid. More big racing ahead during the next two weekends – next weekend in Camden, NJ for Nationals and the following weekend racing in the Hudson Valley Rowing League Championships.